Golaem allows to play more than one motion at the same time on a character. 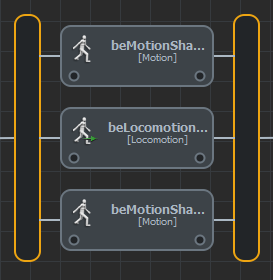 It can be done simply by putting multiple animation behaviors (Motion, Locomotion or Sync) in a Parallel Operator. Thanks to body masks, several motions can be played at the same time on different parts of the body. When doing this there is no real blending, each animation behavior is controlling its own body parts. Animation layers enables to add posture and/or variations motions on top of existing motions (for example breathing, head variation motions, adding hands motions on top of mocap without fingers...). It then does not requires any body mask setup. On top of its convenience, this method enables to get a lot of variety in animation because several parameters can be randomized (relative weights, speed, start percent....). Interpolated Motion Blending mode can enable to generate a whole range of motions given only a reduced set of motions representing the extremes. Same as with animation layers, this can be done thanks to randomized animation weights and speed ratio.